If you are asking if pets eat it and would be ok, then that depends on the amount eaten. Basically, for larva lur, an amount equal to about 1/2 cup would be scattered around the entire perimeter of an average size house. It is applied similar to salt and pepper. Just sprinkle it. If applied this way, it is virtually impossible for a pet to start licking or eating it all up. It would be virtually harmless. Do not apply to concrete, or areas where pets could lick it up. Grass, mulch, under shrubs, etc, are the best areas to apply it. If the pets consumed the entire half cup? It would be hazardous. There are no products on the market that are granular or bait based that are safe for pets to consume. The only "natural" product that is close is Essentria G. Even then, if consumed in large enough amounts, it could be hazardous. It also not safe for pets to eat. 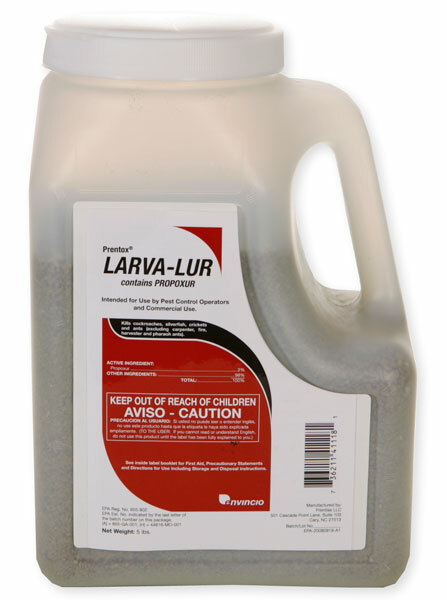 I use Larva Lur around my house all of the time. We have 2 small yorkies, and have never had a problem.